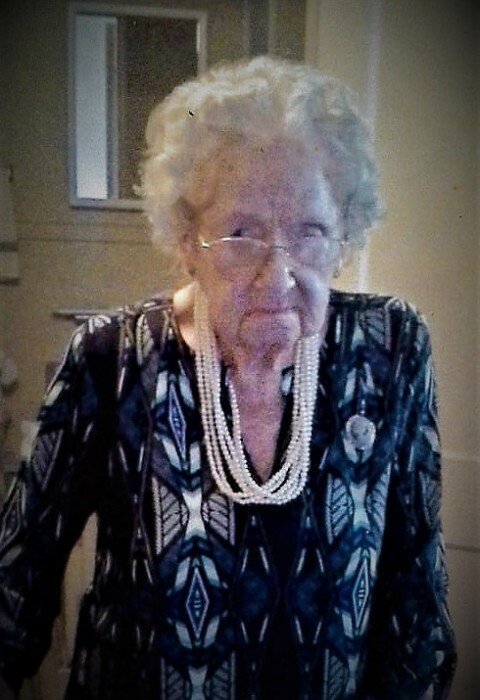 Mrs. Elaine Adams Butts, age 97, of Lanett, Alabama passed away on Sunday, August 12th, 2018 at her residence. Mrs. Butts was born in Valley, Alabama on October 1st, 1920 to the late William “Joe” Joseph Adams and Verna Griffin Adams. She was preceded in death by her husband, Roy Daniel Butts. Mrs. Butts was a dedicated member of the First Christian Church of Lanett. She was a great southern cook and was dedicated to her family, her grandchildren, and her church family. She adored spending time with her grandchildren and her grandson. She is survived by her son, Jeffery W. (Pamela) Butts; grandchildren, Seth Butts, Meaghan Riale; great-grandson, Brock Harp; brother, Donald Adams. Funeral services will be held on Tuesday, August 14th, 2018 at 2:00P.M. EDT at the First Christian Church of Lanett with interment following in Resthaven Cemetery. The Reverend David Bradshaw officiating. Mrs. Butts’ family will be receiving friends at the Johnson Brown-Service Funeral Home in Lanett Monday evening from 6:00P.M. EDT until 8:00P.M. EDT. Flowers will be accepted or the family suggests that memorials be made to the First Christian Church of Lanett in Mrs. Butts’ memory. Johnson Brown-Service Funeral Home of Lanett is directing.